Dr. Harvey's newest base-mix that takes the prep-work and guesswork out of creating a balanced, nutritious Raw & Homemade Diet. Raw Vibrance can be used in rotation with any of our incredible base-mixes & your companion dog will love the variety. 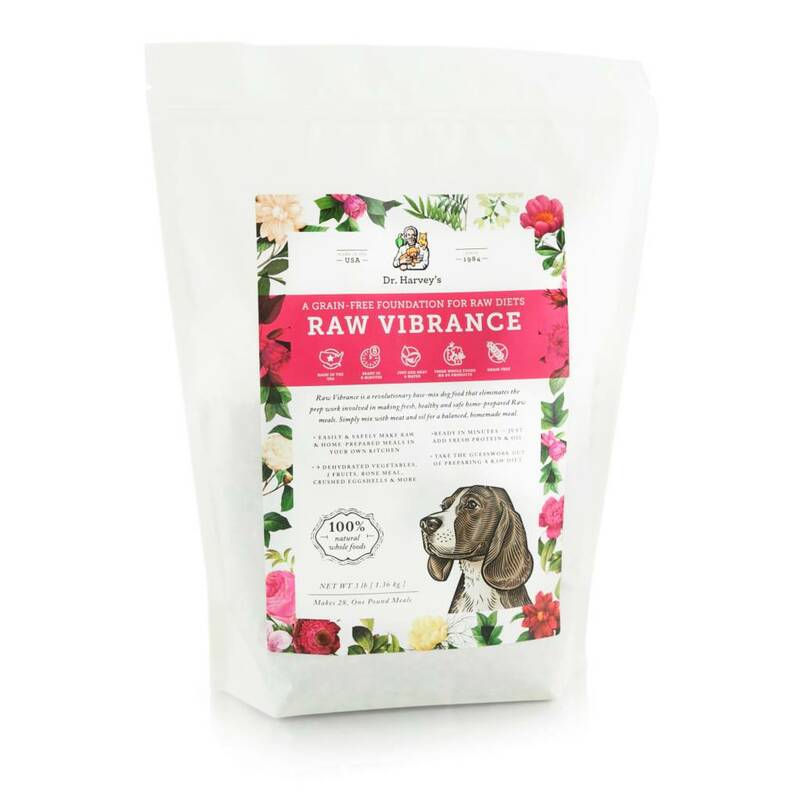 Raw Vibrance is a Grain-Free and Holistic blend of 24 incredible whole foods — including Raw Goat’s Milk, Green Lipped Mussels, Shiitake Mushrooms & Eggshell Membrane. Raw Vibrance makes it easy and safe to prepare a Raw Diet in a matter of minutes, right in your own kitchen. No Guesswork, hassle or mess. Simply add hot water to the base-mix, add your choice of protein and oil – and that’s it! Use Raw or Lightly-Cooked Meat. It’s so easy to prepare! It takes just minutes a day and it’s worth it. 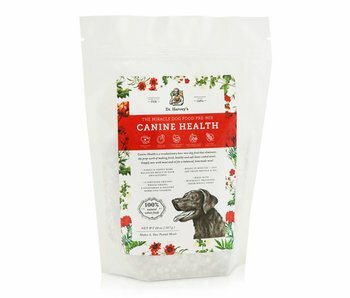 Your dog deserves real ingredients. Step 1 Add hot water to Raw Vibrance. Step 2 Let sit for 8 minutes. Creating a Raw Diet for your companion dog can be surprisingly tricky, messy and time consuming. Even after weeding through the confusing & often contradictory information about how to properly balance a Raw Diet, attempts can still come up short on nutrition. They don’t always have the time in their busy schedule to prepare a complete and balanced raw diet. They are not 100% sure if they are providing their companion with a suitable amount of nutrition. Trying to find the right organ meats and bones can be frustrating. Grinding organ meats and bones can be complicated and messy. Raw Vibrance to the Rescue! Dr. Harvey's created Raw Vibrance to take the prep-work and guess-work out of creating a balanced, nutritious Raw & Homemade Diet. Just combine Raw Vibrance’s nutritional base with high-quality, human-grade protein from your trusted food market, add your choice of oil for healthy fats, and you’re all done! In a matter of minutes — and with no guesswork, hassle or mess — you can prepare healthy and balanced meals every day. 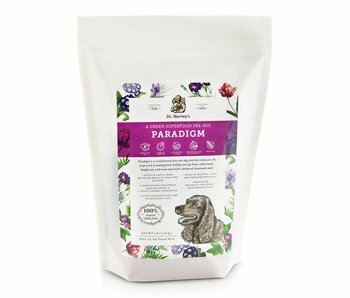 Feeding your companion an incredibly healthy and beneficial raw diet has never been easier! And by the way: we respect that some pet parents aren’t comfortable serving raw meat, or don’t feel that it’s right for their companion. If you feel this way, then don’t worry: you can simply replace raw meat with lightly cooked meat. 9 ultra-nutritious vegetables — such as broccoli, green beans, squash, beets, celery, spinach and more — that are abundant in vitamins and minerals, and contain healthy gut microflora. Bone meal, crushed eggshells and eggshell membranes, which provide the required amount of calcium and support joint health. Raw Goat’s Milk is an amazing probiotic and amazing for your dog’s digestive system. 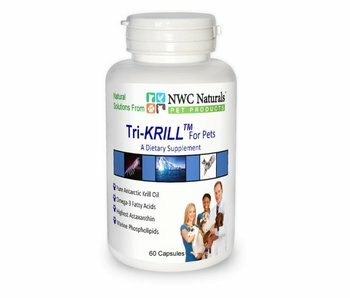 Multiple superfoods like spirulina, kelp and milk thistle, which combine to support tissue repair, enhance liver and digestive functions, and fight a wide range of inflammatory disease. Apples and blueberries that are high in dietary fiber, and contain powerful antioxidants and disease fighting properties. Pumpkin and ginger that support healthy digestion and virtually odorless stool (you’re welcome!). Chia seeds and sesame seeds that boost energy, and are packed with Omega 3, fiber, antioxidants, calcium and magnesium. Green lipped mussels, which are an excellent source of Omega 3 and anti-inflammatory properties. Shiitake mushrooms, which contain potent immune-boosting properties. 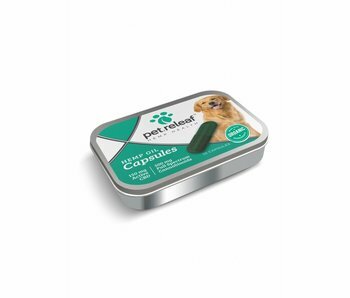 Commercial dog foods use preservatives to give their food a longer shelf life, since meat cannot stay fresh at room temperature for more than a few hours. What’s more, commercial dog foods use dyes, artificial flavorings and other chemicals to enhance the way the food looks and tastes. These additives can have detrimental effects on your dog’s short and long-term health. It’s the best of Mother Nature’s kitchen, by way of your trusted friends at Dr. Harvey’s! Raw Vibrance is 53 calories per scoop. A scoop is approximately 22 grams of the Raw Vibrance dehydrated base-mix. My dogs aren’t on a Raw Diet, do I have to use Raw meat with Raw Vibrance? Answer: No. If you’re not comfortable using Raw meat, don’t worry, you can lightly cook the meat that you add to Raw Vibrance. 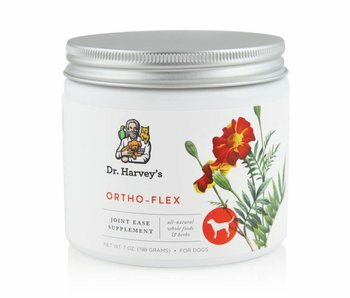 I’m currently using a different Dr. Harvey’s Base Mix, can I use Raw Vibrance also? Answer: Yes. 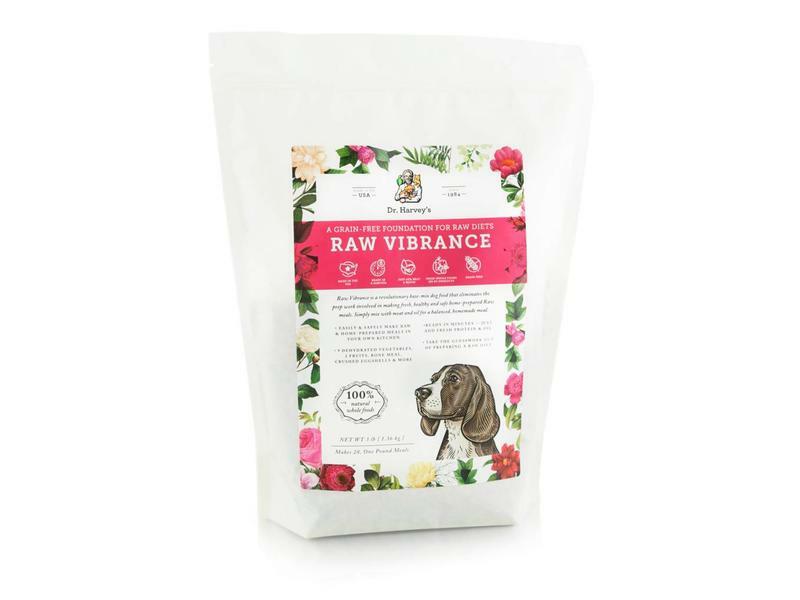 You can use Raw Vibrance in rotation with any of our other amazing base mixes & your dog will LOVE the variety. However, if your dog needs requires a very specific diet, please consult the Dr. Harvey’s team before adding Raw Vibrance into your rotation. Do I have to add Organ meat to Raw Vibrance? Answer: No, you don’t have to add organ meat. However, you can if you’d like to. Do I have to add Bone to Raw Vibrance for calcium? 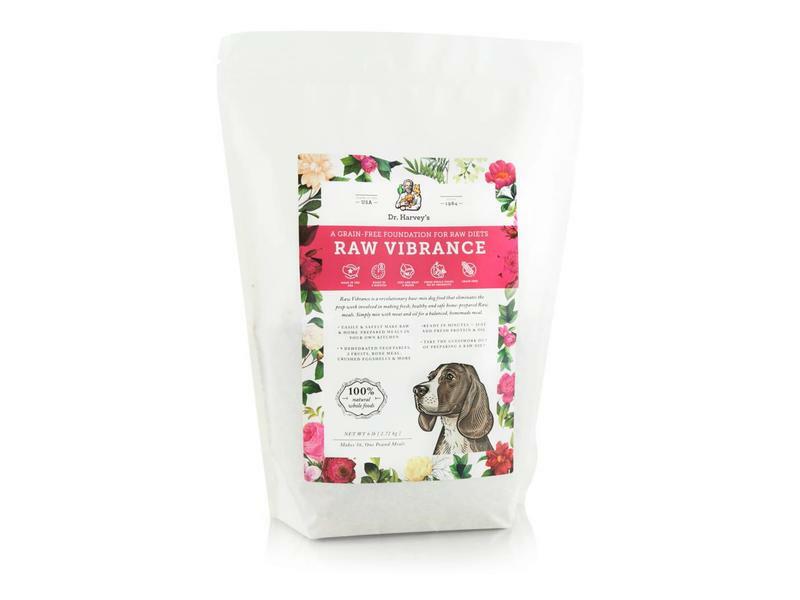 Answer: No, Raw Vibrance includes Bone Meal & Crushed Egg Shells that meet your dog’s calcium requirements.